The merchant was still looked upon as undeserving of the fortune he acquired. Many people regarded them as cunning thieves, who made profit from others work. (4/08/1857). Themerchant is depicted as being sly in his transaction. by James Huffman Editor's Note: This article was originally written for Japan Society's previous site for educators, "Journey through Japan," in 2003. Change was the currency of the Meiji era (1868–1912). From the day the teen-aged Mutsuhito claimed power on January 3, 1868 in a relatively tranquil coup called the “Meiji Restoration” (after his reign name) until his death forty-five years later, Japan experienced an evolution so rapid that one Tokyo expatriate said he felt as if he had been alive for 400 years. An isolated, feudalistic island state in 1850, Japan had become a powerful colonial power with the most modern of institutions when Meiji’s son, the Taisho emperor, took the throne in 1912. Both the sources of these changes and the way in which they made Japan “modern” provide the material for one of human history’s more dramatic stories. They also laid the groundwork for the turbulence of Japan’s twentieth century. Undergirding this political stability were unusually high levels of political and educational sophistication that would make rapid, peaceful change possible in the decades after the Restoration. Though critics talk about the inflexibility and inefficiency of the Tokugawa government, the political system nonetheless ranked among the world’s most effective in tying more than 30 million people together and stimulating an energetic national life. Perhaps the most effective feature of that government was the “alternate attendance” (sankin kotai) system that required most of the 250 domain lords to spend every other year in Edo, serving the shogun, and thus stimulated not only national consciousness but an extensive system of roads (for the travel of the lords’ large retinues), towns (for their lodging), trade, and cultural diffusion. The system also encouraged the growth of important national institutions. Thousands of schools tied to temples, government offices, and private scholars gave Japan a literacy rate of perhaps 40 percent for boys and 10 percent for girls in the early 1800s, ranking it near the top of the world. They also provided a leadership class committed to the Confucian ideal of public service. Industry and trade flourished, even as the samurai class and the Tokugawa government languished economically, giving Japan high levels of capital accumulation. And the culture of the cities was among the most innovative in the world, producing a combination of woodblock prints, kabuki theater, novels, haiku poetry, fashion fads, and lending libraries—much of it tied to the geisha or female entertainers who presided over each city’s entertainment quarters. Scholars have noted that Japan in the early 1800s ranked near the world’s forefront in almost every quantifiable level of development. In this mix, the Tokugawa decision to open Japan to foreigners in 1854, in compliance with American demands, touched off one of Japan’s most tumultuous periods. With newly arrived Westerners demanding trade, showing off new customs (including the scandalous tendency of women to accompany men to public events), practicing the forbidden Christian religion, and taking sides in Japan’s political disputes, the country’s political life changed irrevocably. Opposition to the Tokugawa arose from several quarters. At one level, lower-ranked samurai called shishi or “men of spirit” began agitating for the ouster of the Westerners almost as soon as Matthew Perry and his followers had been admitted. They were too much on the outside to topple the government, but their terrorist acts disrupted the tranquility of political centers in ways that had not been seen for centuries. More directly threatening to the Tokugawa were the growing challenges after the late 1850s from establishment scholars and political leaders of major domains. The shogunate reacted as aggressively as any regime-under-attack might be expected to, but by the mid-1860s, Choshu was in the hands of an anti-Tokugawa administration, and by late 1868, Shogun Tokugawa Keiki concluded that the best way to preserve order was to resign as shogun and create a system in which he likely would share power as the chief among a council of leaders. His scheme failed, however, and on January 3, 1868, a coup d’état in Meiji’s name brought to power a group of young, visionary samurai from the regional domains. The government that came into being in 1868 had three overriding characteristics: its leaders were young; its policies were pragmatic; and its hold on power was tenuous. The emperor in whose name the new governors ruled was just seventeen years old; the major samurai power-holders from Satsuma and Choshu domains ranged in age from the upper 20s to the “senior” Saigo Takamori, who was just 41; and Iwakura Tomomi, the most important nobleman in the leadership clique, was 43. By Japanese leadership standards, these men were mere juveniles—unbound by the networks and mores of traditional leadership. This, perhaps, is what made them so pragmatic; they developed policies without the restraints of ideology or custom—or of any overriding vision of where Japan should go. Confucian tradition discouraged commerce, but they moved Japan as forcefully and quickly as possible into the world of international commerce. Whereas they once had supported the idea of national seclusion, sometimes fanatically so, now they made the West their model and pursued internationalization with a vengeance. Samurai and nobles all, they abolished the class and status systems and disbanded the feudal domains. One of their central slogans, kuni no tame (“for the sake of the country”) said it all: their overriding commitment was simply to national strength, regardless of what customs or ideologies had to be violated in the pursuit of that goal. The tenuousness of their power was illustrated by the Boshin War, a violent conflict between the new regime and the Tokugawa followers, which raged for a year and a half after the Restoration. Though the coup often has been called bloodless, and though the carnage was indeed lessened by Keiki’s surrender in February 1868, thousands of his supporters resisted in a civil war that left more than 8,000 dead by the time the fighting ended in Hokkaido in June 1869. It was little wonder that journalists predicted the imminent collapse of the Meiji government well into the 1870s. All of this meant that the first Meiji years were characterized by a seat-of-the-pants, try-this-try-that style of governing. A “charter oath,” issued in April 1868 promised to unify the classes and seek knowledge from around the world in order to strengthen the emperor’s rule. No one seemed, however, to know just what that meant initially, as the government grappled with inadequate revenues, challenges from imperialist nations, threats from the regional domains, conspiracies by disgruntled samurai across the nation, and a complete lack of precedents for the organizational structures the modern era demanded. One result was that the government structure was reorganized repeatedly in the first years. Another was that membership in the leadership faction kept shifting. Still a third was that policies were revised often. At the same time there was a single, clear direction: toward centralization, solidarity, and involvement in the broader world. And always there was a commitment to making Japan a modern nation, accepted as an equal by the world powers. Internationalization showed up in two ways. First, the new leaders studied Western models with a zeal born of deep fear that weakness might invite invasion. They sent missions to the West, including a 50-member group headed by head of state Iwakura Tomomi in 1871–1873, to negotiate and to study institutions such as banking, schools, political systems, and treaty structures. They also dispatched young people to study in European and American educational institutions. And they brought hundreds of Westerners, called yatoi (or, in some scholars’ telling, “live machines”) to Japan every year until the late 1870s, to teach English, build railroads and buildings, create an educational system, edit newspapers (for foreign consumption), and teach science. The result was an urban craze for things Western—everything from men’s haircuts to drinking milk, from the solar calendar to ballroom dancing—that made city life heady. Second, the movement onto the international scene made treaty revision one of the government’s central goals. The treaties of the 1850s had limited the tariffs Japan could charge on imports to an average of about five percent and had required that foreigners who committed crimes in Japan be tried in the courts of the foreign consulates (a system called extraterritoriality). Beside being humiliating, the restrictions deprived Japan of both sovereignty and tariff revenues, money desperately needed for modernization programs. As a result the government sought endlessly to secure fairer treaties during the 1870s. The British consistently blocked reform, however, and extraterritoriality was not ended until 1894, tariff limits until 1911. The treaties thus served as a constant reminder of just how important modernity and power were to Japan’s success in the international arena. Without being regarded as “modern,” Japan would not be taken seriously by Britain and the other imperialist powers; without strength, it could not challenge the foreign gunboats. The movement toward centralization was illustrated partly by a raft of new regulations: the 1871 decision to replace the semi-feudal domains with modern prefectures, the issuance in 1872–1873 of laws to create a military draft and to require three years of school for all boys and girls, and the standardization of a land tax. It was illustrated more dramatically by two major crises, both centering on the role of the old samurai class. In the first, the Crisis of 1873, the leadership faction was rent asunder by a bitter foreign policy dispute. After Japanese diplomats in Korea had been spoken to rudely by Korean officials, the state council decided to send Saigo Takamori as an emissary to demand an apology, realizing fully that such a mission could precipitate war. When progressive officials, who had been abroad with Iwakura, heard about the plans, they were aghast—not so much at the idea of war as at the potential cost. They managed through intensive maneuvering to get the decision reversed, and the popular Saigo quit office in a rage, taking a number of followers with him. The result was a leaner government, and a less popular one. The second crisis, the Satsuma Rebellion of 1877, was even more serious. After the government had abolished the samurai class in order to save the huge cost of paying annual stipends to every member of the class, a civil rebellion broke out in the southwest—headed by Saigo. The results were devastating, on every level. Word that Saigo was leading the rebellion sent shudders through the country. Former samurai everywhere questioned the government’s policy of using a commoner army to fight the rebels. And the cost was staggering: eight months of bloody fighting, millions of yen, 10,000 men injured, more than 6,000 deaths, and a powerful sense of national loss. Historically, however, the Satsuma Rebellion marked a positive watershed for the Meiji government. With Saigo’s defeat, the country was unified as it had not been since the Restoration; the government’s legitimacy was established; the transitional decade was over. Few would have considered the Restoration era complete, however, until a new political system was in place, a system approved as “modern” by the international powers. Only after creating the new structures noted above and defeating the recalcitrant samurai could the rulers focus their energies in that direction. Before looking at that process, however, a word must be said about the impact of the many changes on the country’s broader populace. If the new system was hard on the traditional samurai class, it was devastating for vast numbers of people: the fishermen, the rickshaw pullers, the construction workers, miners, prostitutes, and newspaper sellers who made the rapid changes possible by doing the hardest work and receiving the least remuneration. The largest such group lived in more than 60,000 villages, where some 28 million farmers (out of a population of 35 million in the late 1870s) provided the country not only with its food but with the bulk of its taxes. The cost of modernizing and expanding the government was placed overwhelmingly on land taxes, which meant that farmers had to bear the brunt, either through direct taxation or in the rents they paid to landlords. When the government’s fiscal retrenchment led to depression in the early 1880s, rice and silk prices plummeted, and bankruptcies soared, pushing many into destitution and thousands into local uprisings against the system. Another group hurt by modernizing policies were Japan’s factory workers, particularly the tens of thousands of girls and women who were forced by poverty into working in the expanding silk and cotton factories. Their willingness to work under inhuman conditions for pittance pay helped Japan compete on the world market; it also produced surprising amounts of resistance, with workers absconding, engaging in work stoppages, and even striking. A more positive result for the general populace was the diffusion of new ideas and practices into every nook of society. The 1870s saw former samurai in the northeast offend the Buddhist spirits by beginning to eat meat; they saw the rise of barbering and dairy-farming in the Tokyo region; they saw the spread of railroads, modern postal networks, fire-resistant brick buildings, a banking system, public schools, language institutes, modern hospitals—in short, every “modern” institution known in the world’s most progressive cities. The arts also changed, as Western style painting took root. Novels and fiction became increasingly popular, though complex characterization would have to wait until late in the century to become the norm. And literate Japanese by the tens of thousands began reading newspapers. While it would take several more decades for modernity to penetrate the countryside, cities were literally transformed by the drive toward international respect and domestic centralization in this first Meiji decade. The driving force in all of this lay with the government during the early Meiji years, but one of that force’s most exceptional features was the role of private, popular groups in shaping the political evolution. Indeed the drive toward creating a constitutional system—which everyone agreed was the essential characteristic of a “modern” state—was fueled by a constant, fierce struggle between popular and official forces. (Refer to the Enactment of the Meiji Constitution.) In the mid-1870s, for example, a vigorous “movement for freedom and rights” (jiyu minken undo), led by both former samurai and commoners, stirred the national political life mightily with rallies and petition drives demanding a national assembly, a constitution, and broader participation in the government. When a financial scandal prompted massive protests against the government in 1881, the officials responded in part by promising that a constitution would be granted within a decade. And when Japan’s first political parties were created in response to that promise, the government seriously set about the task of drafting that constitution. The political intensity quieted in the mid-1880s, but not the drive toward constitutional government. Ito Hirobumi, one of the youngest Restoration leaders and now a dominating force in official circles, led a group to Europe to study political systems, then headed a task force that created several new institutions (including a peerage, so there would be a pool for selecting a House of Lords) and drafted Asia’s first national constitution. His models and chief advisors were German statists, and when the constitution was promulgated on February 11, 1889, it placed sovereignty solely in the emperor and gave Japan a relatively weak legislature and a strong, transcendent cabinet, with the prime minister appointed by the emperor. But the impact of the freedom and rights forces was apparent in the constitution too, because it also assured limited freedom of speech, religion, and assembly, gave the legislature veto power over the budget, and created an independent judiciary. It was, in short, a middle-of-the-road document that placed Japan in the mainstream of the world powers politically. Papers from London to Shanghai hailed the arrival of constitutional government in Asia, while commoners across the nation celebrated with fireworks and speeches this evidence that the Meiji Restoration’s promise had been fulfilled. Though dramatically changed, Japan would not have been called modern yet in 1889 by most observers. The two post-Restoration decades had, however, planted all of those seeds that would mature into full-fledged modernity and imperialistic vigor at the beginning of the twentieth century. At least three legacies of the Restoration decades merit discussion. The first is nationalism. The rise of nationalism—often called the most important feature of the late 1880s and early 1890s—showed up in many ways: in the widely-heralded pride over the constitution, in the issuance in 1890 of the Imperial Rescript on Education, a stirring document in which school students regularly recited their loyalty to country and emperor, in the increasing public discussions by young writers of Japan’s greatness. One of the most articulate vehicles for the new nationalism was a journal named simply Nihon (Japan), launched the day the constitution was promulgated, for the express purpose of reviving the “unique spirit of the Japanese people.” The seeds of the new national pride lay in the early-Meiji soil, when the government had worked so hard to make the entire populace aware of their Japaneseness, creating national holidays, making the emperor both sovereign and high priest, sending Tokyo newspapers to every part of the country, instituting compulsory education and military service. By the twentieth century, the nationalism would become worrisome, as it propelled Japan into aggressive actions abroad. At the end of the Restoration period, however, people saw it merely as an effective means of getting people to support the state’s drive to modernity and power. The second departure of the 1890s was the rising importance of military affairs in national life. In 1894, Japan launched its first major foreign war since the 1500s (and its second foreign war ever), thrashing China in the Sino-Japanese War and beginning its experience with empire by securing Taiwan as a colony. A decade after that, it defeated Russia, one of the European powers, setting the stage for colonies in Korea and Manchuria. And with those wars, the army and navy became central actors in nearly every national decision, major factors in the country’s political and economic life. Again, the early Meiji years had set the stage. One of the earliest slogans of the Restoration era was fukoku kyohei (rich country, strong army); in 1872 Japan had begun drafting men into the army; and in 1874, it had sent 3,000 troops to Taiwan, for a short, victorious engagement with aboriginal groups who had killed some 54 shipwrecked Okinawans. The nation also had begun the acquisition of territory in these years, taking over the Ryukyu Islands to the south in 1879, three years after negotiating with Russia to gain control of the Kuril Islands to the north. All of these were relatively minor episodes, but they confirmed a fundamental approach. 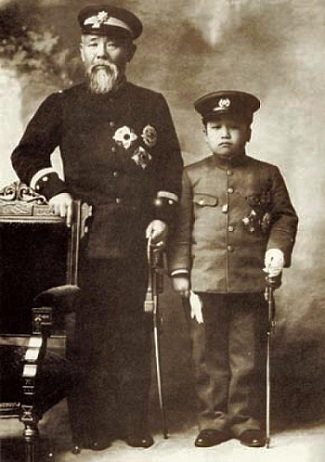 Convinced that military strength alone would assure respect and security in an imperialist world, the early-Meiji leaders had set the nation on a course toward military might, a course that would make war and empire central facets of national policy by the turn of the century. The third legacy of the Restoration years was the march to modernity. Most students agree that the period between the Sino- and Russo-Japanese Wars saw a genuine mass society emerge in Japan’s cities. These were the years that gave Japan its first major industrial takeoff, the period that produced mass-circulation newspapers, department stores, publicly treated water systems, social and class divisions, moving pictures, wristwatches, safety razors, increasingly popular public intellectual debates, and beer halls—all the trappings of modern, urban society. (See Sino-Japanese War.) And they were the years in which commoners, called minshu, began to take an active part in the nation’s public and political life. To say that this development represented a mere speed-up of the early Meiji programs is to state the obvious. When the Charter Oath promised in 1868 to seek knowledge from around the world, it set Japan on a course of studying, emulating, adapting—and finally surpassing—peoples everywhere, a path that would bring the Restoration era to fulfillment, even as it launched Japan into the more troubling arena of colonialism and empire.